Seema left her manager’s office walking on cloud nine. She’d just been informed that she was on the HiPo pool of the organization and as a result would be put on the fast track. She felt pleased that her hard work and efforts had been recognized and that this would now mean she would be able to pull ahead of the pack. Seema typifies today’s young leader. Hungry, ambitious, driven to do well, motivated by pulling ahead of her peers, sees social recognition as important and has a lifestyle that requires a constantly increasing salary. Her assumptions around career growth are generally vertical i.e. climbing up the ladder, governed by social norms and keeping up with the progress of her batch-mates. Very soon, someone is going to assign her a short-term assignment or a job-rotation that is designed to develop her for the next step up in her career. And this is all to the good. The challenge however, is how often such practices fail. Because we don’t accurately measure such practices, there is little record or dialog about the perils of HiPo development. When a professional accepts what is usually a “stretch” posting, they are driven by a desire to realize their potential and to get ahead of competition. What they don’t realize is how damaging such a move can be. In reality, the greatest risk sits with the individual while the organization barely risks anything at all. Should such a move fail, the individual (in most but not all organizations) will be labeled a failure, organizational memory is long and s/he will carry this stigma for the next few performance cycles, ’til the time s/he overcomes it with a stellar performance. Often, these failures lead to these individuals being dropped from the HiPo pool. Many times they result in an attrition. In a similar vein, expat assignments are seen as developmental and they are. However, the challenges with expat repatriation are only now being acknowledged. A recent survey found that 16% of expats quit within 2 years of repatriation (up from 11% 3 years ago) and why not? Because 41% of them were placed back into the role they had left. The organization that went to so much trouble to develop them did not think to make use of their widened perspective and broader skillsets upon return. Transition support – provide a coach and a mentor (both). The mentor for helping them internally through the challenges of the culture and rapid adaptation to the new role/challenge. The coach to help them fast-track the acquisition of skills and competencies required to “scale up”. An explicit conversation between the individual, line manager, senior leader and HR around the risks of the role and how they will be managed, including impact on the individual’s performance and career. The fall-back plan must be clearly discussed. Articulate clearly the skills/competencies that the stretch assignment is supposed to build, identify clearly which aspects of the role will lead to those competencies being developed and ensure the individual is provided those opportunities. Many times the role is given but the exposure is limited, which ultimately leads to a waste of time and resource for everybody. Buy in from the line manager who will lead this individual through the stretch assignment is critical. An explicitly articulated plan for the role the line manager will play exponentially increases the chances of success in such roles. Executive sponsors must be assigned with a direction to check-in fortnightly in the first 2 months and monthly from then on. This will ensure the individual has a skip-level support in case it’s needed. Peer support groups. Create self-sustaining support groups of 3-4 HiPos so that they can reference each others’ learnings and challenges. The power of Alumni. Ensure previous batch HiPo’s take on roles as mentors to the younger HiPos. They will be able to provide powerful tips and advice on settling, navigating, emotional challenges and success strategies. Have strong expat return plans. Ensure they do NOT get back into the role they left but have a wider or more challenging remit upon return. Record data for all such practices over long periods of time so that the data can be mined for insight and corrective action can be taken based on longitudinal indicators of success/failure. If you’re like Seema and just got informed that you’re on the HiPo pool, start talking to your leader/HR to ensure some of the above gets discussed and put into place as a support mechanism for you. All the best! Women Shining: What lies beneath? 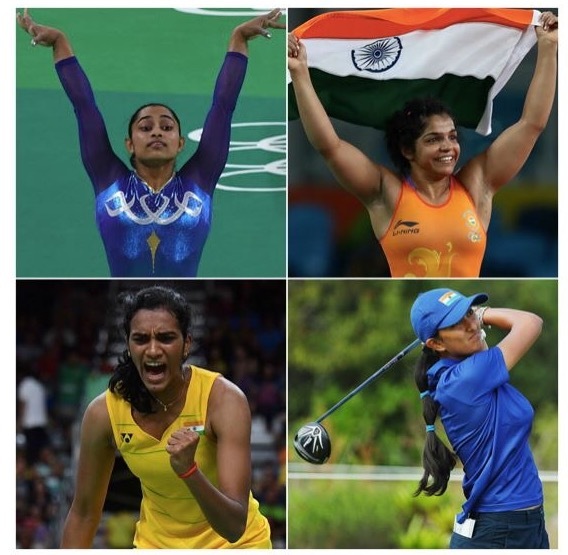 The last week has seen a surge of nationalistic pride in the achievements of Dipa Karmakar, Sakshi Malik and PV Sindhu. Many others also acquitted themselves better than Indian competitors have in the past. Public memory is short and we tend to forget but over the last 3 Commonwealth Games and Olympics, the medals tally and top 6-8 finishes for Women athletes from India has been growing exponentially compared to men. As we engage with women across corporates, we are seeing a similar trend i.e. women are beginning to equal and even outperform men. If you’re at all curious, you begin to wonder why? Is it because women are feeling more emancipated? More confident? Getting more opportunities, you wonder? Probably yes, but there’s more. YSC‘s research, based on 360 degree surveys of over 500 men and women, shows that men and women show up differently in terms of strengths. This indicates that women place a higher emphasis on work ethic i.e. diligence, dutifulness and perseverance. And they take personal accountability for delivering results. This is further reinforced by a study by 3M which found that women work longer and harder than men. Over decades of profiling/assessing senior leaders of both genders we have learned that, at senior leadership positions, women score higher on every competency when compared to men. This leads us to conclude that women have to be superior to male candidates when competing for a role at senior leadership. That while a reasonably competent man can be selected, a woman must be exemplary in order to earn the right to the same role. It is likely then, that this competitive scenario, drives women to work harder and build higher levels of skill. Interestingly enough, it appears that the gender bias against women, has caused the modern woman to respond differently from her peers of earlier generations. No shrinking violet, today’s woman is taking the fight to the men, not by becoming like them but by being herself and becoming better than them. As I write this, I have just heard that Aditi Ashok has been eliminated from the final round after an exceptional performance. No matter, she has brought Golf into mainstream consciousness for many Indian women, as has Deepa for Gymnastics and Mary Kom did for Boxing in years past. As I observe the young Indian woman (my own daughters too) in every field of endeavour, I am assured of one thing, that Indian women are a force rising. They will continue to raise the bar and in the very near future, we will see women claiming their place in sports, organizations, politics and at home. 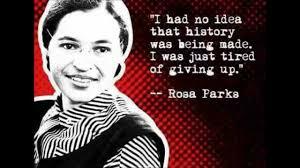 As a tribute, I close with the words of the intrepid Rosa Parks. Since the world has changed on us so much, shouldn’t the role of the CEO also change? I have been thinking about this for a while and only yesterday in conversation with a friend, did it crystallize into a form that I was able to clearly articulate. Have a strong sense of the outside, of the shifting competitive landscape and to develop a sense of emergent disruptive forces. However, if you were to ask any CEO how much time they would devote to the above in totality, the answer (for about 80% of them) would be 20% of the time – for all 4 activities. So what is today’s CEO busy doing? Managing the present takes up a majority of the CEO’s time. The QSQT (Quarter se Quarter tak) i.e. quarterly earnings pressure is the biggest bane in the CEO’s life today. Everyone from the board to the investors to the analysts are focused on ensuring this numbers continues to grow quarter on quarter. Any slack results in reduced share prices and doomsday announcements. A slack of 3 quarters in succession and you might well be asked to leave. Managing the leadership team. CEO’s spend an inordinate amount of time managing resources, managing across silos, making key decisions on an operational basis. This job belongs to the CEO’s direct reports, who must be adult, mature and aligned so that they collectively own the big picture and run the day to day operations of the business, leaving the CEO with adequate time to focus on the strategic and the external environment. Ownership of the operational P&L: Fully delegate the achievement of the P&L to the Leadership Team (LT) i.e. his Direct Reports. The LT should present P&L achievement to the board and take full accountability. The CEO’s role is to play facilitator and step in to aid decision deadlocks or resource prioritization but as an exception and not a rule. Be accountable to the board for culture and capability building. The CEO’s core KRAs should focus on developing organizational and leadership capability with an eye on the future. Spending time on articulating the competitive strategy, deriving the capability set from this and then ensuring leadership and culture development to meet the capability needs should form a large part of the CEOs focus. The board should hold the CEO accountable for future sustainability as the steward of the organization. However, too many boards hold CEOs accountable for managing the present, thus diluting their focus and limiting their vision horizons. Develop a strong sense of the external environment. This includes not just competitors but also adjacent industries, macro-economic indicators, socio-political factors, socio-technical advances, emerging disruptors. It also involves maintaining strong relationships with analysts, investors, industry peers and consultants. Developing external clout via membership with industry bodies and regulatory authorities in order to hone their ability to influence the direction of the industry. As we move forward, environment and regulations will play a major role in competitive differentiation both from the PoV of consumers and government. CEOs will need to be strong in this area. Being digital. Please notice, I used the term “Being” digital. This means CEOs must be digitally savvy, must be active consumers/users of emerging and mainstream digital technologies. This will enable to understand the power of digital as a consumer and enable deep insight into how they can leverage this personally and for their organization. Just being informed is not enough. Being disconnected is suicide. What gets measured gets done. What gets reviewed, gets done well. Boards would do well to follow these adages and redefine what they hold a CEO accountable for. Is there an impending Leadership crisis in emerging markets? The years 1995-2010 have been kind to the BRICS nations. All of them experienced hockey-stick growth as countries, which was underpinned by local entrepreneurs who leveraged globalization, cost arbitrage, local resources and domestic consumption in order to demonstrate growth. Organizations grew at 20+% CAGR for a decade or more. Small players became large global or pan-national in size, scale and complexity. As they grew in size and complexity, over the last 15 years, these organizations fueled the management consulting industry. Their needs to develop systems and processes to manage scale and complexity and drive talent and culture befitting a large entity drove this trend. Across the BRICS nations the big 4 management consulting firms made a majority of their revenues from government enterprises and domestic entrepreneurial businesses. However, as the wheel of time turns, we are now approaching yet another inflection point in the history of these organizations. This is related to the looming middle-management and senior leadership challenge that these nations and the organizations are going to face. It is true of political parties, of government enterprises and domestic businesses. The fact is, most professionals who began their career after 1995 have not seen a downturn. They have grown up in hockey-stick economies, riding the waves of fortune. The capabilities they have developed the most are the ability to rapidly respond to demand. In countries like India and China where populations are high, the competitive scenarios for brands was not as extreme and even mediocre brands flourished. Each professional ascribed success to him/herself and did not realize that her growth and development was incomplete and largely skewed towards solving the problem of supply. In the last 3-4 years, the economic meltdown has finally caught up with the BRICS nations and established it’s grip. Growth has slowed down significantly. Going from 9% to 6% GDP may not appear large but the impact on job-creation, sustainability and the competitive landscape is phenomenal. The linear predictability of the past is history. Each of these economies is seeing heightened competition from both domestic businesses desperate to maintain the growth to fuel the debt and financial commitments they have made and global firms that have no choice but to focus outside their own 0% growth economies. Fundamentally, the rules of business, the rules of success, have changed. With the present crop of senior leaders, those who have seen 30 year careers and experienced multiple cycles, due to retire, the baton must pass on to the younger leaders who have only grown up in plenty and have only seen the dynamic described above. While these leaders bring intent, aspiration, dynamism to the table, they lack a rounded leadership experience, as do the potential successors who follow them. This then is the challenge for the HR, Talent, L&D professionals and for the Human Capital Consulting firms. How do we support these leaders who are not rounded, to rapidly develop the resilience, agility, depth and breadth to manage the expectations that will be placed on them. How will they find answers to grow in a world they have never experienced before? The challenges placed by the incumbent leadership pipeline on the Talent professional of today are very different from the challenges faced by HR professionals of a decade or two ago who lived in predictable times and could employ linear approaches to identification and development of future talent and successors. The same holds true of leaders who are mentoring their successors. They need to do more than they received and they need to do some things differently. Speed up iteration of experiences. We do not have the luxury of 10-15 years to grow these leaders. Hence we need to find ways to squeeze an experience set of a decade into 3-4 years. This needs to be done consciously and planfully. And will demand focus on the “70” of the 70/20/10, something that most HR teams have not been good at. These experiences must include breadth, must shatter insular mindsets and beliefs, must foster collaborative approaches. Hold on to your retiring senior leaders. Appoint them as mentors and advisors. This also means being careful about how they are positioned because the risk is to perpetuate the old and create barriers for success. 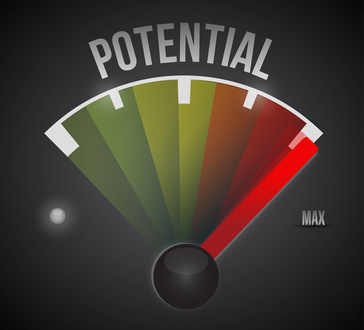 Scientific assessment for potential. Confirmation bias and intuitive approaches to identifying future successors will ensure repeats of old behaviours, will ensure we select the like-minded, will ensure we select for the present and not the future. Bring in outside in perspectives to senior leadership selection. Use a consistent and unbiased method. Deeper board involvement. Boards, whose primary role is to derisk the organization and ensure sustainability of the business, need to get more deeply involved in succession to at least 2 levels below the CEO. This will also ensure a governance over an existing leadership that can tend to be operational by nature. Complete revision of the competency set for senior leaders. Many organizations are still referring to 10 or 15 year old competency sets for their senior leaders. These need to be revised and at the earliest, in order to be more relevant to the future these leaders will inherit. The above are just some ideas for what would make a difference. I would love to hear your thoughts about what’s coming and what needs to change. While this is largely an emerging markets scenario, I would also be keen to hear about the challenge facing mature markets and slow-economies. If you could share your perspectives in the comments section, that would be very helpful. 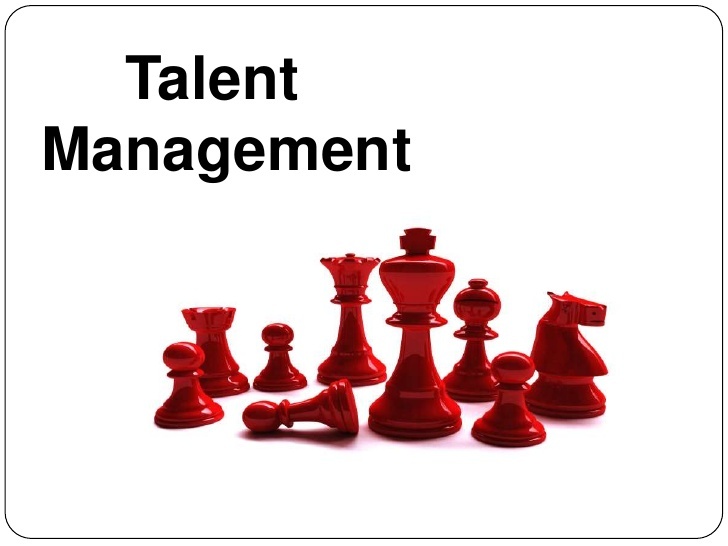 Centralization of talent management: The 90s and early 200s saw organizations going global at a rapid pace and in order to maintain agility of decision-making many organizations went the federal route, giving wide-ranging power and authority to country or regional offices. As a result, many developed sub-practices of their own. This fostered innovation and creativity and resulted in best practices emerging from offices away from HQ and enabled organizations to scale up capability. However, on the flip side it didn’t bode well for consistency, efficiency and in many instances, it resulted in islands of fiefdoms that the HQ had little control over. Efficiency & Consistency: During the last 7-8 years, as growth has flatlined, there has been an increased focus on cost management; efficiency drives have discovered that across countries and regions they’ve had 100s (and I do mean 100s) of leadership programs being run independently of each other. In order to bring method to this madness, organizations have centralized leadership and talent management, undertaken a strong housekeeping exercise to keep the best practices and ensure they are consistently followed across the globe. The war for talent: As economic uncertainty becomes a reality, a leader’s ability to be agile, flexible and responsive in a dynamic environment becomes increasingly important. This adds an additional filter to what we expect from talent and makes the definition of “Talent” even tighter; thus resulting in an even smaller pool of available talent. This necessitates a need to manage this scarce resource with greater ownership and as with all things critical, HQ centralizes control. Professionals’ aspirations have changed: they are more mobile than ever before and have expectations of roles across the world. The only way to manage this is to have a centralized view of the organizational talent landscape. Global saliency of talent: Time was, talent search or poaching was a local phenomenon. Today, a search for talent has global scope and search firms are increasingly being asked to widen their net and search for the best talent across the world. This puts increasing pressure on talent management and retention but also highlights that an organization needs to have the ability to source it’s internal talent across global offices. 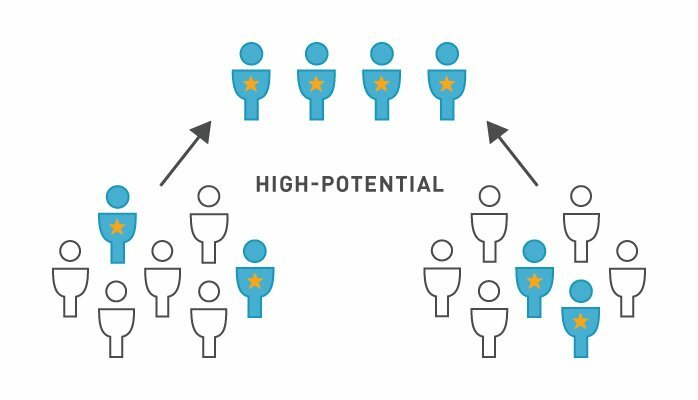 From a talent resourcing perspective this demands a global view of talent and a consistent framework for talent identification and development all of which have led to centralization of talent management. The Talent Acquisition function will increasingly be asked to play the role of Talent Resourcing, which means look within before casting the net outside the organization. Talent Management and Talent Acquisition will need to be more joined up than ever and we might even see the creation of a Talent Resourcing function that assimilates the two. Focused development versus carpet-bombing: Prior to my consulting role, I was OD & Learning head for 2 Indian conglomerates and I remember most leaders carrying KRA/KPIs around ensuring that all managers and above completed 5 person-days of training each year. It’s interesting how we don’t see that metric at all anymore. In just a few years it has completely disappeared off the KPI sheets. Tighter budgets, demands for clearer RoI and a realization that these spends didn’t have enough overall impact have led to this change. 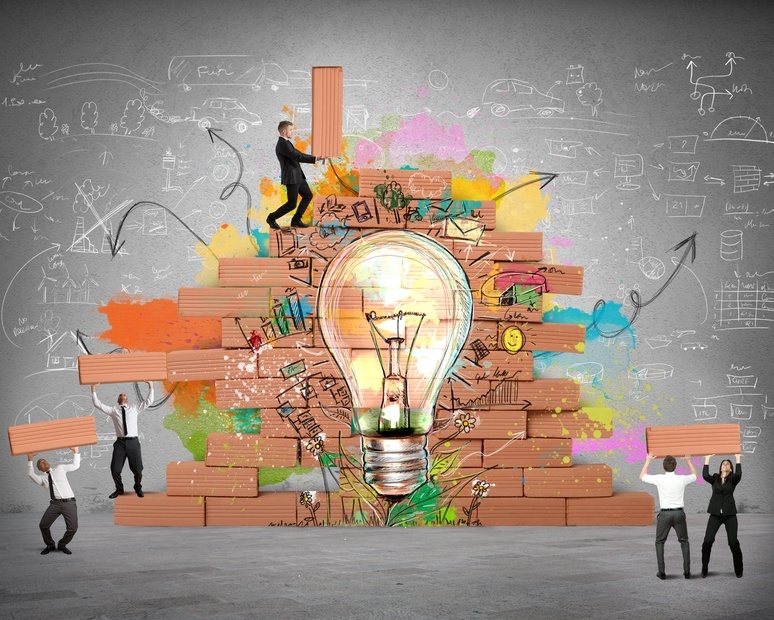 Development plans are now more specific to the individual and this has placed a demand on both HR and line managers to be clearer about growth potential, strengths and areas of development in order to craft bespoke development plans. Such bespoke development plans also provide clearer measurement of impact and results. They’re easier to track and manage but also require greater involvement from both Line Manager and the HRBP. Deeper understanding of critical roles: Out of all the roles that exist in a function and amidst all the hierarchy that’s built up (especially in emergine markets companies or manufacturing environments), there are some roles that are more developmental than others. It is vital for HR and Line to work together to identify these specific roles and highlight those as key postings for developing leaders. For example, a shift from managing a sales beat to managing area sales requires an individual to move from managing self to managing others and is a key journey-point in a career. Deeper understanding of developmental impact of a role: Line and HR will need to have greater clarity on the developmental impact of a particular role. 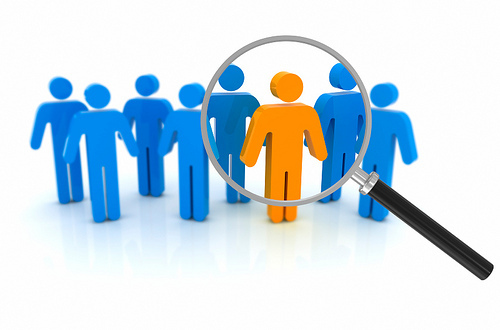 Knowing which skills are required as an entry point into the role is important. But even more vital is to be clear about the new skills/abilities that a role will add and that an incumbent must acquire before being moved out of the role. Understanding what contributes to the acquisition of that skill is equally vital since sometimes a role may be diluted of exactly that attribute ensuring that the individual spends time on the role but will not take away the key learning. For example if a controller in the accounting function has no exposure to treasury because his manager prefers to manage that part of the role, the controller’s development will be incomplete. Hence having a method to measure or assess that the individual actually acquired the key skills before they exit that role is key. Career paths: In order to accomplish any of the above and in order to provide challenging all-round development for future general managers, each organization needs to have a well-developed understanding of how their managers have grown. Designing career trees but more so, being clear about the career forest i.e. which branches intersect with other trees is critical and will equip HR and Line Managers with the ability to define development plans that ensure an individual plays to their strengths and builds on future development needs. This is by no means a definitive list of all that is changing in the world of HR and Talent Management. What are some changes you are seeing? Do share your thoughts on the comments section and help build a more complete understanding of the new face of Talent Management. As the industry picked up momentum and many new coaches hung up shingles and got into the market, HR and organizations adopted coaching almost as if it were a “Silver Bullet” that would solve their problems. However, the organic and protracted timeframes of impact, inconsistent results and inconsistent coaching quality ensured that the euphoria quickly waned. Today, HR professionals are wary of selecting coaches and a lot is being written and debated about the effectiveness of coaching. For decades, the training and development industry has grappled with methods to demonstrate a return on investment. Coaching providers now find themselves in a similar predicament to prove their worth. The coaching industry, recently estimated to be over $2 billion annually (ICF, 2012) is increasingly used as an intervention for behaviour change or leadership development. Whilst the growth in the use of coaching suggests that it is valued by users, Executives and HR buyers of coaching services, quite rightly want to see the value of their spend. Alongside this growth in demand, there is an influx of coaching practitioners striving to expand their client group. Coaching is a highly desirable second or third career path for business professionals and is unregulated both in terms of the required training and the use the title ‘Coach’. This presents an unusual dilemma for a growth industry in which supply is higher than demand. The coaching buyer can therefore afford to be selective in their choice of coach, but how do they unearth the effective coaches from the ineffective. Given the financial investment and the pressure for HR colleagues to demonstrate the commercial worth of their interventions it is unsurprising that coaches point to financial gains for the individuals. Coaches using Kirkpatrick’s model to calculate a financial return on investment (ROI) to claim significantly high financial ROI’s ranging from 340% to 5000%. However, the very reasons that coaching is used as an intervention are the same reasons this kind of measurement is difficult and debatable. Coaching is bespoke, dynamic and works with the complexities of human change. It also integrates the rapidly changing context that Leaders are required to navigate. There are many mediating variables between individual behaviour and business results. Calculating a financial ROI therefore involves multiple extrapolations and often biased inferences to arrive at a result. Buyers should therefore be wary of such claims and ask for further detail on their calculations. Whilst calculating a definitive financial ROI is tenuous, there are other avenues coaches can use to demonstrate value, measure effectiveness, and document change. Executive and leadership coaching serve two purposes – the organisations need for strong leadership and individual leaders need for accelerated growth. Coaches walk the line of these two forces for change. Effective coaches explicitly link the two to measure their impact. An ‘objective setting’ meeting at the outset of coaching, involving the line manager, coach, coachee and where applicable coaching sponsor is key to aligning goals and establishing the potential business value of individual behaviour change. Socratic questioning to clarify and probe thinking is not just a powerful coaching technique, it can help to define the value of behaviour change. For example, a common goal in executive coaching is to increase influencing skills. Using repetitive socratic questioning such as asking “what would that enable?” to establish the links between behaviour change and business outcomes is an easy and enlightening method. In this way, the coach is also progressing the thinking of the line manager and instilling accountability for change with all the involved parties. Many coaches use their past careers as an Executive or their previous industry experience to tout their credibility. The risk with matching a Coaches experience too closely to the client challenge is the tendency for the coach to do more mentoring than coaching. It is hard not to give advice when you have ‘been there and done that’. 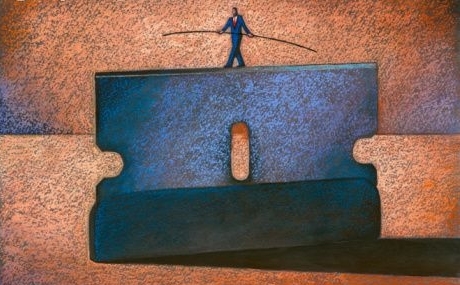 Effective coaching does not rely tips, techniques or expertise as the centre focus. Coaching uses questioning and supportive challenge to equip individuals with their own resources to apply to future challenges. This is the key difference between coaching and mentoring. Mentoring is the sharing of knowledge and expertise for an individual to apply to their own context. Coaching develops personal resources such as insight, confidence, resilience, emotional management and self-directed learning. These resources create the conditions to see new possibilities and evolve as a leader. These deeper changes can be generalised and therefore outlast the coaching engagement. An effective coach can should be able to articulate and where possible measure, deeper levels of change. The complexities of psychological change not withstanding, existing HR platforms such as 360 degree feedback or personal development plans serve as simple tools for measuring individual change that are often overlooked. Although 360 feedback is not a new tool, when asking the right behavioural questions a report can highlight discrepancies between an individual’s self-perceptions and colleague or customer experiences of the individual. These discrepancies cause internal discomfort for people which forms a powerful motivator for change – to shift behaviour and close the perception gap of our ‘ideal self’. Development plans are often seen as a ‘tick-box’ process but they are a pragmatic tool to facilitate conversations around behaviour goals and measurements of change. Like other behaviour changes we try to make in life, such as weight loss – giving the behaviour in question focus is a compelling motivator for change and creates an inherent feedback loop. Using your own organisation’s platforms is a quick way to demonstrate effectiveness to share with business colleagues. Finally, coaching can be seen as the ‘silver bullet’ that will address all leadership challenges and development needs. A coach who is confident of their ability to take on any client should be viewed with caution. An effective coach will seek to understand the challenges the leader faces and the needs of the organisation before committing to coaching. This is both to determine whether another intervention might be more suitable and to determine whether the individual is ready to be coached. A google search for the term – Leadership generates 48,90,00,000 hits. A similar search for the term Followership generates 4,19,000. That means there are 1168 times more articles about Leadership as there are about Followership out there. I believe it’s important to have equal focus on Followership – the behaviour of followers, their attitudes, beliefs, fears, concerns and challenges. Consider this: Amit, a leader, returns from a transformative experience. He has decided to be empowering, humble and to have an open door policy. He announces his decisions to his team with great enthusiasm. A few days or even weeks go by and he realizes that his team is not “taking him up” on the offer. That they continue to behave the same way as before. When he delegates and empowers, he finds his people keep coming back to him for decisions. He is surprised, disheartened and upset. He feels his team isn’t supporting him or doesn’t trust him. Why do you think this is so? There is always a gap between leadership and followership. This is accentuated in hierarchical organizations where followers have grown used to “following orders” and doing what’s asked of them. They come across as passive or conformist but it is also true that these individuals have not had the opportunity to develop the “muscles” that enable them to embrace empowerment; rather, they have grown up in a world where their leaders took decisions and hence they are comfortable being deliverers. This is true of any system. Individuals get used to their leaders’ style. When this changes suddenly, they are unable to “turn on a dime”. As leaders consider personal change, they must realize that it is equally their task to enable their followers to make the complementary changes that are required. This is equally important for change agents and OD professionals to understand and acknowledge. Many leaders however, believe that once they have changed themselves, everyone else will/must follow suit, as if it’s switching on a lightbulb. The followership ethic of an organization is the shadow of the style of the leaders; just changing the leadership style is not enough. The leaders must take responsibility for enabling the followers to change. Leaders are responsible for systemic change. Practical and pragmatic leaders understand that their teams will need to go through equal pain in order to make the change. They recognize the role they must play in helping transform mindsets and build capability “muscle strength” so that muscles that were never used before can now be developed. Some followers will never make the change because they are too accustomed to the “earlier way”, their own fears of irrelevance, of not being able to adapt will become their worst enemies. Leaders must understand this and support where required and prune where necessary. 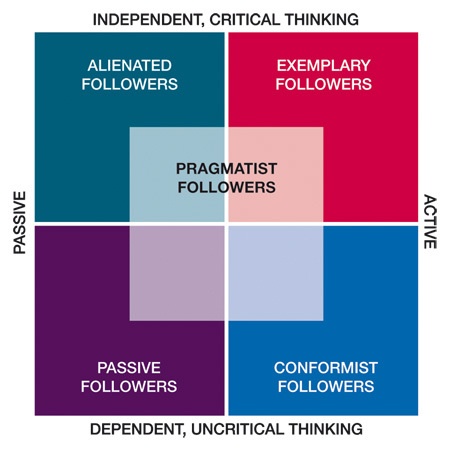 Leaders must diagnose the followership ethic in order to ensure effective and rapid organizational transformation and growth. Agile followers are able to adapt to the changing needs of the organization and their leaders. 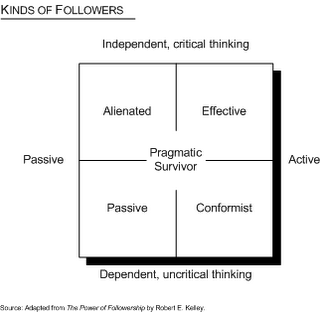 However it is the leadership that must invest in developing these followership characteristics. When leadership and followership come together, the whole is greater than the sum of the parts. How many of these qualities do you as a leader see in your followers? What are you doing that inhibits the ones that are missing? What do you need to influence? What do you personally need to do differently? What have you consciously made happen and can take credit for?